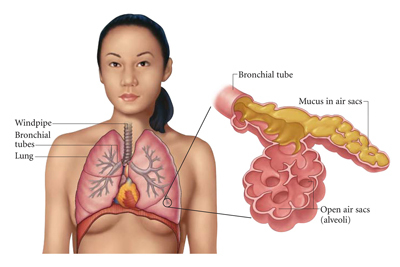 You have pneumonia when there is an infection in the small air sacs in your lungs. Caused usually by viruses, bacteria, or fungi, both children and adults can have this infection. While most symptoms will be the same as in cold or flu, you may not have a sore throat or nasal congestion with pneumonia. Be sure to inform your doctor about any symptoms you are experiencing, especially if you have chest pain after pneumonia. Your doctor will consider your symptoms to determine the best treatment plan. Pneumonia refers to a lung infection that causes pus or fluid buildup. This buildup can limit the flow of oxygen and lead to chest pain. You may also experience chest pain when you have breathing difficulties because of pneumonia. In most cases, a virus like influenza causes pneumonia, but you may also have it due to a bacterial or fungal infection. Streptococcus pneumonia is responsible for causing this bacterial infection in the lungs. Your symptoms depend on the severity and cause of the infection. Some common symptoms include mucus buildup, worsening cough, and labored breathing. These symptoms may also lead to severe pain in the chest walls. Along with chest pain after pneumonia, here are some other symptoms you may experience after pneumonia. A cough is the most common symptom of pneumonia and is the result of the infection in the airways. The cough you have may sound moist or congested, and you may also expel phlegm or mucus. Coughing can also lead to a sore throat or chest pain. Be sure to talk to your doctor if you have a worsening cough along with chest pain. When you have pneumonia, it is quite common to have a fever as high as 105F. In many cases, you may also be sweating and shivering. It is also common to have chills, dizziness, fatigue, and headaches. It is possible to develop some gastrointestinal problems due to pneumonia that can lead to vomiting and nausea. This in turn can suppress your appetite and make you weak. These symptoms are usually more common in children. There may be a change in your heart rate due to the infection. Some patients also complain about having a pulse that feels faster than usual. Sometimes, you may also have a headache and feel dizzy too. After developing pneumonia, it is common to experience a sore or achy sensation in your body. These body aches can make you feel irritable, fatigued, and lethargic. Things get even worse when you have body aches in conjunction with stomach upset, fever, breathing problem, and cough. Antibiotics: Your doctor may prescribe antibiotics if you have bacterial pneumonia. Keep in mind that it usually takes some time to correctly identify the type of bacteria. Cough medicine: Your doctor may prescribe some cough medicine to control your cough and prevent chest pain. Keep in mind that your doctor will not try to eliminate your cough completely because it actually helps loosen and remove mucus and fluid from your lungs. Therefore, it is usually a good idea to use the lowest dose of a cough suppressant to manage your symptoms. Pain relievers: Your doctor may also give you pain relievers to help control body aches and reduce fever as well. The most common drugs are ibuprofen, aspirin, and acetaminophen. Your blood pressure is not stable. You breathing rate is high and you have breathing difficulties. Your heart rate is not normal. You may have to take your child to the hospital if they are younger than 2 months, have breathing problems, are lethargic, or have low blood oxygen levels. Be sure to get as much rest as you can and increase your intake of fluids to prevent dehydration. Take a cough suppressant only when it is severe and makes it difficult for you to rest. Remember, a cough is your body's way to get rid of mucus and fluid in your lungs, so it is better to avoid any cough suppressant unless it is severe and causes vomiting or breathing difficulties. Take acetaminophen or aspirin if you have a fever or you feel tired. Keep in mind that aspirin is not suitable for anyone younger than 20 because it increases the risk of Reye syndrome.